Since Ava got back from visiting her grandparents, I thought I'd post a drawing that she had done back in January of this year, that seems appropriate. It's quite an elaborate piece, and it's actually on the backside of another drawing that I've posted earlier. This was post-cousin Matt visit, so there's certainly some details going on here. Ava tells me that she and I are going to Mema's house (Andrea's mom) in a car, and that there are cats around and a squirrel, too. There are trees lining the road, all the way up to the house, as Mema and Pawpaw wait for us to arrive. The squirrel is just to the left of the car, with a nut. Looks like he's putting it in the tree there. There's also a bee flying around, as well. 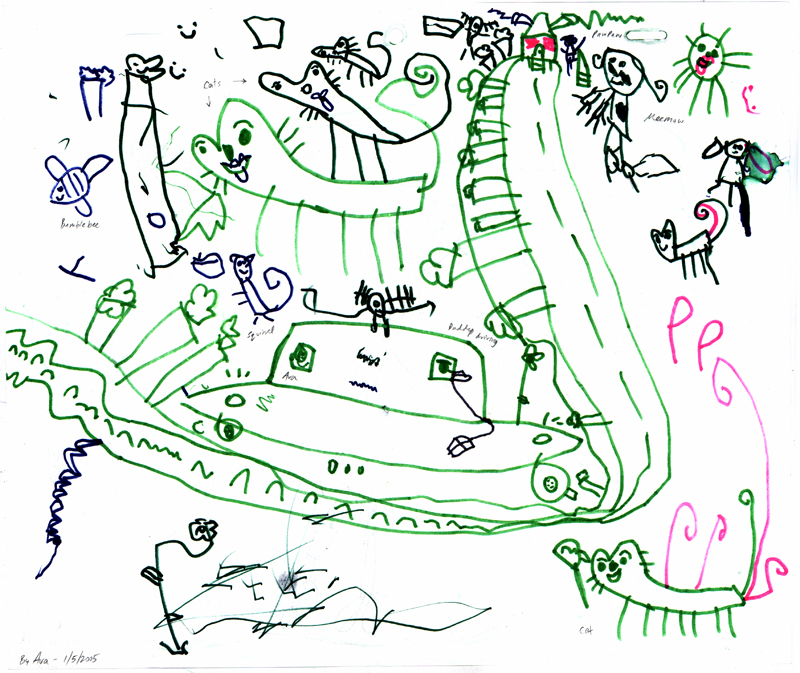 I really love how Ava drew the car, as well as the way she drew the cats. The trees alongside the road are a nice touch, as I'm sure that that's what she remembers when she goes and visits her grandparents. It's what she sees outside her window the entire trip (we drive up to Illinois each time we visit). What is especially cool for me to see here is her use of perspective, as the road seems to go back in space, all the way up the page. The house looks very far away, and Ava drew the road getting smaller, it seems. Not sure what that that bizarre contraption is on top of the car. Antennae, perhaps? Looks cool, though. yeah, this is a wild little drawing. after our crazy marathon road trips, I'd probably be drawing pictures like this, too. It also reminds me of Chris Hinton's brilliant short, Flux, which was based on children's drawings. Have you seen it? like it all ! but especially the terrific shape of the cats and how they're stacked one atop the other. I'm so glad you do this every week, I love it. Whoah, this is one crazy drawing: a spaceship with a face (!) journeys through a bizarre landscape with giant (mice?) appearing from nowhere to attack the poor ship! And the city is under constant attack from a latest wave of invasion! Will the ship be able to save the day? Will he?? OK, that's not what Ava has in mind but it's great to draw stuff like this based on one's experiences! this is one of my favorites! i like all the detail - and yes the cats are very unique - i really like the way she drew them. and the happy faces everywhere - or happiness is showing through. what i like about these drawings is it's her very own interpretation with no real influences yet. that is a great thing to capture for her. My favorite part of this drawing is the way the trees turn upsidedown and sideways as the road curves upward. Why doesn't my brain work like that anymore? ?